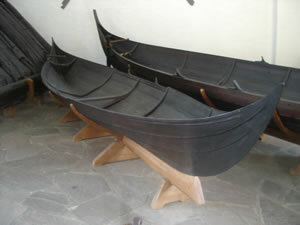 Scandinavia has an ancient tradition of boatbuilding; it was probably here that clinker construction was invented. This is the technique of overlapping the strakes (planks) and riveting them together; the name ‘clinker’ comes from the Norse word ‘clinke’ for a rivet, from the sound riveting makes. In fact very many English nautical terms are directly descended from Norse: Mast, Keel, Strake, Oar, Sprit, Sail, Deck, Rudder, Nail are all examples. 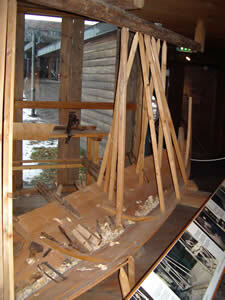 Clinker built boats are naturally light, strong and flexible; in early times the strakes were stiched together and this technique was still in use in the far North of Norway in the late 19th century because people there could not afford nails for riveting. By 800 AD the form was fully developed and it then changed little for over a thousand years. The 7th century Gokstad Faering is essentially the same as the faerings which were still being built in Norway 100 years ago. The design spread, indeed at one time the Vikings were exporting ‘flat-pack’ faerings to Shetland where there were no trees to build from. These designs influenced boatbuilding in Britain and elsewhere and boats such as Yoles and Sexerns are direct descendants. Traditional boatbuilders had no drawings but worked from simple rules and used a notched stick called a ‘boat ell’ to check certain measurements. Faerings were working boats used for travel up and down the fiord and for fishing, especially herring fishing, up to ten miles offshore. Rowing long distances was hard work and when engines began to appear in the early 20th century they quickly became popular and the craft was almost lost. It was largely through the interest of Bernhard Faeroyvik, a schoolteacher, that the old designs were preserved. 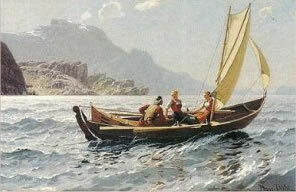 He spent most of his life from the early 1920’s on, travelling round Norway measuring and creating drawings of the different local varieties of faering and other traditional boats. It is from this archive that we have drawn the designs we use. 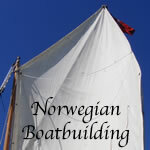 The Norwegian boatbuilding tradition is one of the great vernacular traditions of the world. It evolved from the materials and tools available and suited the environment is which it developed beautifully. It is equivalent in this way to the coracle, the Eskimo sealskin kayak, the North American Indian birch bark canoe, Irish curraghs, the dugout boats found in Africa and Asia and S America and the Proas and other fast sailing craft of the pacific.